All Pro Sports & Entertainment has put its trust in a newer agent — Adam Bakow — to lead the firm in its expansion efforts. Adam Bakow graduated from Eckerd College with a B.A. in Communication and with a concentration in Sports and Entertainment. He is admitted to practice law in the state of Colorado. Currently, Adam is a CFLPA Certified Agent/Associate General Counsel with Colorado-based All Pro Sports & Entertainment. He has extensive background in the industry, including seven-plus years of experience with the New England Patriots, New England Revolution, Boston Cannons, Andretti Racing, and the Eckerd College Athletic Department. Adam is in the process of submitting his NFLPA application and taking the test in July. He represents Yuri Foreman, a professional boxer, along with two minor league baseball players, Audry Santana and Malquiel Brito. Connect with Adam on Linkedin and Twitter. 1) You attended law school two years after obtaining your undergraduate degree. What motivated you to attend law school school? As a follow-up, why did you originally decide to work in sports? I realized without attending graduate school I would have almost no chance to make it in the player representation industry. I thought law school would give me an edge over similar students going after their MBA. I originally decided to begin working in the sports industry as a way to merge my passion for sports with a career in marketing. I quickly realized through working with teams and colleges that player representation was where I wanted to be. 2) How did you obtain your first client? What was your first contract negotiation like as well? I got lucky with my first client. After many rejections from cold calls, I managed to land my first client who had actually been a classmate of mine at Eckerd College. He is an auto racer who I represent for marketing purposes. I assisted with negotiations with several NFL and CFL clients including, Jamal Miles, Dontay Moch, Devin Smith, and DJ Smith. This helped me gain experience with many different contracts and narrow down what the best attributes to each were. 3) You’ve held a few marketing positions in your career, including with the New England Patriots and the New England Revolution. How has that helped in your role as a CFLPA Certified Contract Advisor? It has helped by providing me with some additional experience of how professional sports teams work from the inside, which is a valuable insight that I can provide to my clients. Marketing is a very important service that agents provide for their clients, and having a clear understanding of it helps with many aspects of the industry. 4) Mentorship is incredibly important and arguably necessary to work in sports. Has there been any one person or few people who have mentored you throughout your career? As a follow-up, what knowledge have they instilled in you? The first person who helped mentor me through the beginning of my career was Evan Ortiz, the former Sports Information Director at Eckerd College. He taught me some essential skills for dealing with the media and helping prepare clients for interactions with the media and being in the public spotlight. He also taught me how to be a statistician in basketball, soccer, and baseball, which helped me gain a competitive edge over other up-and-coming agents and more insight into the industry. 5) If there were one or two aspects of the agency business that you could change, what would that be and why? The one thing I would want to change about the business would be to level the playing field and force all agents and agencies to play by the rules. A lot of agents and agencies, including myself abide by these rules and often lose to other agents who give gifts, money or other benefits to potential clients and their families to secure representation. 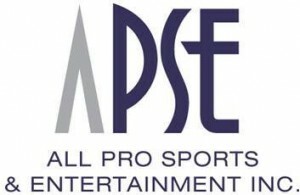 6) In 100 words or less, what advice would you give aspiring sports business professionals who want to work at an agency like APSE? The business is not nearly as glamorous as TV and the movies may make it out to be, but if you are willing to put in a lot of time and hard work, it is an incredibly rewarding experience.